With her exhibition at the Secession, video artist Saskia Olde Wolbers is showing a selection of her work in Austria for the first time, including a new piece Pareidolia (2011). Since the mid- 1990s, she has been developing fictional documentaries often loosely based on factual events. Her intricate videos are driven by a combination of otherworldly imagery – meticulously handmade model worlds – and the apparent inner monologue of the voiceover in the audiobooklike soundtracks. The films are shot underwater. Miniature sets dipped in paint to create unstable imagery that abstractly illustrate the narrator’s thought process. 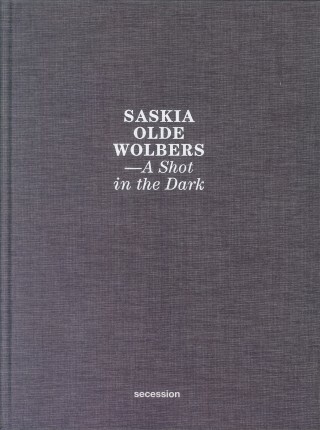 Three works by Sakia Olde Wolbers are on show in the Galerie at the Secession: Pareidolia (2011), Trailer (2005) and Placebo (2002). 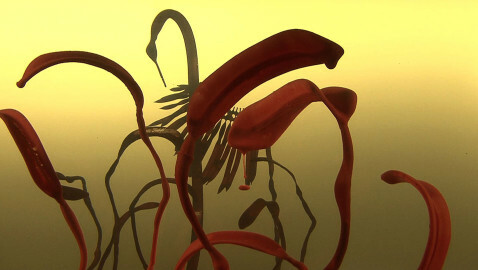 Pareidolia (2011) has as its narrative a fictional take on the situation leading up to the creation of the book Zen in the Art of Archery, by Eugen Herrigel. A popular book set in Japan in the 1930’s that created a cult following for people in Europe in the post war years. The author’s interpretation of Zen, pivots around an event he witnessed where his tutor, the eccentric archery master Awa Kenzo, shoots at the target in the dark and succeeds to split the first arrow with the second. In Herrigel’s book the master then exclaimed; It, the Divine, has shot! Apparently neither man spoke each other’s language and the man who served as the translator between the German professor and the master was absent the night Herrigel witnesses this epiphany. Pareidolia is told from the fictional point of view of this translator and his alter-ego, a bird, and their musings over hunting versus Zen archery and the creation of the popular book. When asked to retranslate the book into Japanese, his character questions subjectivity, translation, and belief. The title points to the need for caution where stories are involved: “Pareidolia” refers to the tendency of human perception to discover meaningful pictures in random structures. While the story being told is based on an event that cannot be shown, the title alludes to the fact that story-telling is based less on exact observation or pure fiction than on illusion and deception. The film’s visuals are shot inside models of an university lecture theatre, an archery hall and traditional Japanese interiors, alternated by animatronic birds drinking from dripping plants. 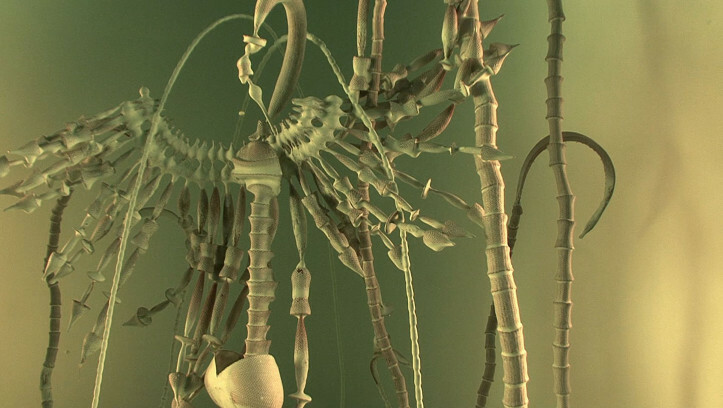 The lo-fi animatronics, were created using the material Nitinol. Placebo (2002) is loosely based on the life of Jean-Claude Romand, a Frenchman who for eighteen years pretended to work as a doctor for the World Health Organization. In Olde Wolbers’ video, we hear the account of a woman who regains consciousness in a hospital after a car accident. In the bed beside her lies a man in a coma. We learn that he had claimed he was married and that he worked as a surgeon in the hospital where they both now lie – and that the narrator was his mistress. When he realized that she is becoming suspicious and that his deception might be revealed, he crashed his car into a tree. The story plays with the clichés of marital unfaithfulness and the phenomenon of Pseudologia Fantastica, a disorder whose sufferers create an alternative life for themselves based on a structure of compulsive lying that becomes increasingly blurred with reality. 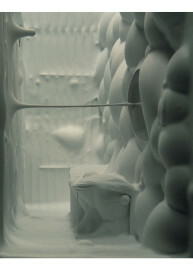 Placebo‘s imagery shows the interior of a hospital; corridors, cubicles and effervescent pills descending through the frame, as seen inside the mistress’ head. White oozing paint drips of the sets, as the images she build in her head while listening to his made up accounts of his days working there are disintegrating, literally melting away. In Trailer (2005), a man watches a cinema trailer that seems to speak to him directly. He realizes that he is the illegitimate child of two former and now-forgotten movie stars. The revelations eventually bring back memories of life in the jungle, into which his parents disappeared after waiting in vain to shoot a film on location in Kinema Color, an obscure format outdated almost as soon as it was invented. During this journey into memory, plant life appears alien and stylized, as in a dream. For the narrator, the deserted cinema becomes a gateway to his lost childhood. In this sealed-off world, nature appears manmade, while architectural space, the lipstick coloured cinema, appears human. Trailer’s story was inspired by the book Uncommon Knowledge by Judy Lewis, the illegitimate child of Clark Gable. Soon after she was told he was actually her father, he passed away giving her access only to the actor version of his person. In Olde Wolbers’ slowly unfolding spaces of memory submerged in paint and water, the characters and their stories reveal the inherently contradictory, fluid, and ambivalent quality of truth and fiction. They remind us that moving images are capable of totally overriding such distinctions. Saskia Olde Wolbers, born in Breda (NL) in 1971, lives and works in London.